Persons aged under 16 are no longer able to obtain a personal watercraft (PWC), also known as a jet ski, endorsement on their restricted marine licence. Peter Corcoran, Director of Maritime Safety at Transport Safety Victoria (TSV), explained that the provisions relating to PWC endorsements in the Marine Safety Act 2010 (Vic) have been amended by the Ports and Marine Legislation Amendment Act 2017 (Vic). “PWCs weigh more than 300 kg, quickly reach speeds of 100 kph and require strength and skill to control. They have the potential to injure or kill, particularly when operated by young and inexperienced people. “To improve safety, the Victorian Government has amended laws so that no new PWC endorsements will be issued to people under 16. The change will not impact on people who already hold an endorsement,” Mr Corcoran said. “Several PWC incidents in recent years have led to serious injuries to the operators or others and we want to reduce those numbers. “Persons under 16 are not responsible for all incidents involving PWCs but they’re often the ones lacking the strength or maturity of judgement to handle these high-speed vessels safely,” Mr Corcoran said. Under 16s and other unlicensed people can learn to ride a PWC under supervision, that is, with a person on board able to take immediate control who is over 18 with a PWC endorsed marine licence. 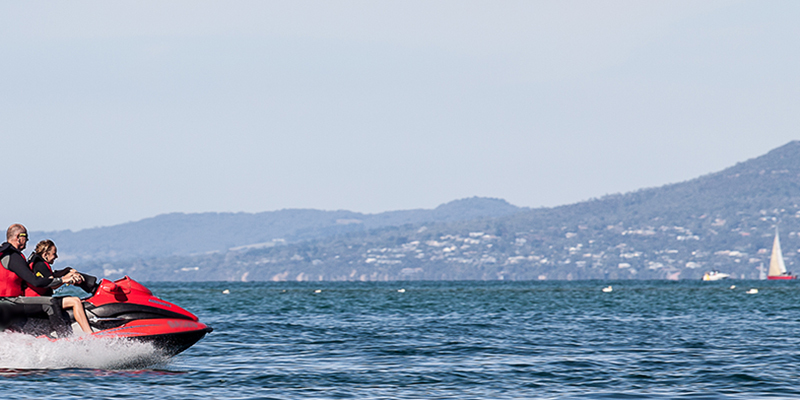 Maritime Safety Victoria (MSV) and Victoria Water Police officers will be on the water this summer, focussing on unsafe PWC riding. Reckless operators who ignore the rules put themselves and others at risk. Those doing the wrong thing are likely to receive a fine and could have their vessel embargoed. Read more about PWC safety.